The Bible is surprisingly candid about the difficult moments of life. While well-meaning friends and self-help books often offer pat answers, God knows that things get complicated and messy, and that there are times where even he doesn’t seem to make sense. This is particularly the case when we grieve over the death of a loved one. At these times of loss, even those with the strongest of faiths ask legitimate questions and struggle with hurt and doubt. God can seem strangely distant and quiet. The comfort which God offers those who mourn through the pages of the Bible does not come as lofty truth or cold theology. As men and women just like us, who also suffered through loss and grief, pour out their hearts and emotions in poems, prayers and letters, we are carried along with them. At first keenly feeling their pain as it resounds with ours and then gradually working through our sorrow in helpful healing steps. Those who have walked the dark days of loss speak of working through a process towards healing and wholeness. The one they have lost is never forgotten – in fact the memories remain as sources of comfort and joy – but life is renewed as we find support and meaning in the relationships that remain and look to God for ongoing purpose. 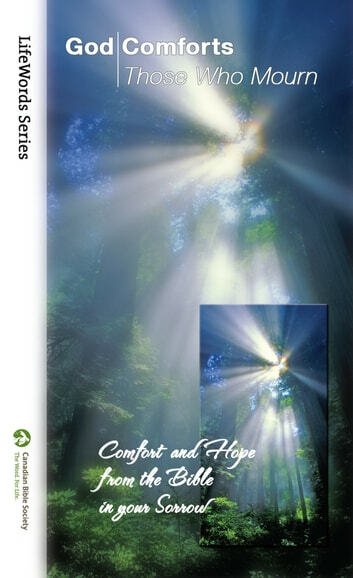 The selections from the Bible collected in this booklet have been grouped into the stages of progression through the grieving process. You may find it helpful to read right through the text, or to work slowly through the sections one at a time as they each reflect your thoughts in the difficult weeks ahead. Prayer might not come naturally for you, but rest assured that God listens, and that no special formulas or words are necessary for him to hear. Some of the Psalms we will be reading together show us that there are times where the best prayer for the moment consists simply in crying out to God in our frustration and misunderstanding. Be daring when you pray, and ask for his comfort and strength each day. Some people also find it helpful to journal their progress. On some days the only thing that may come to your mind are the words that you have read, but Christian tradition suggests that there is value and comfort in simply transcribing in your hand some texts that have been particularly helpful or challenging to you. Those who help the grieving agree that while there are times where we crave solitude and loneliness, sharing the process with someone we trust is healthy and helpful. We encourage you to find someone with whom you can reflect about what you are reading and the progress you are making. Above all, we pray that through these words of comfort from the pages of the Bible you will sense God’s loving invitation to find rest and peace in him.